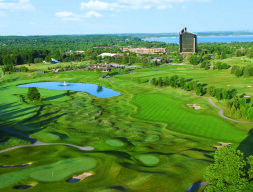 Grand Traverse Resort & Spa is “Michigan’s Premier Resort Experience.” The 900-acre resort is located near Traverse City along the sandy shores of Lake Michigan’s Grand Traverse Bay. One of the Midwest’s finest full-service, year-round, golf, spa, vacation and conference destinations, the Resort offers nearly 600 rooms and suites, and condos, 86,500 square feet of versatile meeting space, plus outdoor function venues. The Resort has 54 holes of championship golf including The Bear, a Jack Nicklaus signature golf course, The Wolverine, a Gary Player signature golf course, plus the Grand Traverse Resort & Spa Golf Academy. Additional features include a full-service spa with cherry-theme services, tennis program with indoor and outdoor courts, 100,000-square foot health club with indoor and outdoor swimming pools, 15,000-square foot Indoor Water Playground, children’s center, shopping gallery, diverse restaurants and lounges and year-round recreation. An award-winning destination, Grand Traverse Resort & Spa has been ranked among the Top 20 Mainland Resorts and Top 50 Travel Destinations and Services by Condé Nast Traveler magazine, Golf Digest, GOLF Magazine, Family Circle, Successful Meetings. Grand Traverse Resort & Spa is proudly owned and operated by the Grand Traverse Band of Ottawa and Chippewa Indians. For more information about specials, rates, and packages or to make reservations, call 800-236-1577, or visit http://www.grandtraverseresort.com. Hotel, Tower, + studio, one-, two-, and three-bedroom condos.